Place the beans in a large bowl with cold water and let them soften overnight in the refrigerator. Strain and rinse until the water turns clear. Boil the means until tender in a liberal amount of lightly salted water. Season them as they cook, and remove from heat when they are tender inside, but not overly cooked. Keep the beans covered with boiling water the entire time they cook. Strain in a sieve. Mix oil, vinegar, and minced garlic together and blend the dressing with the warm beans. Heat oven to 250 C. Brush the peppers with a bit of oil and bake them for ca 15 minutes, or until the skins are nearly black. Turn while they cook, so the skin blackens all the way around. Place them in a freezer bag and let them cool off. Carefully remove the skins, rinse the seeds out, and cut into thin strips. Trim the ends off of the beans, and boil in lightly salted water for 3-4 minutes, or until tender with a bit of bite remaining. Cut the anchovies into thin strips. Roughly chop the basil. 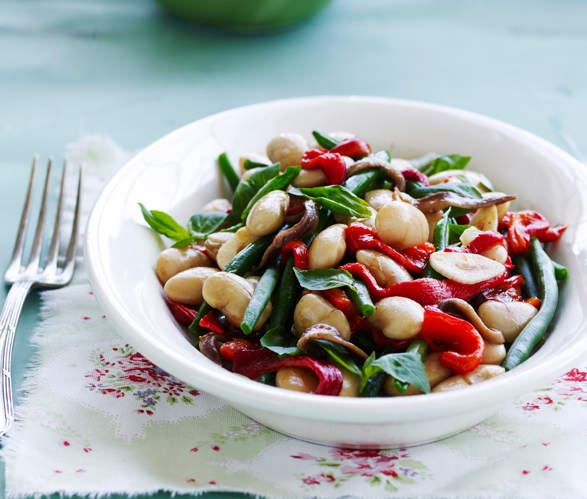 Blend peppers, anchovies, and basil with the beans. Season to taste with salt and more wine vinegar. 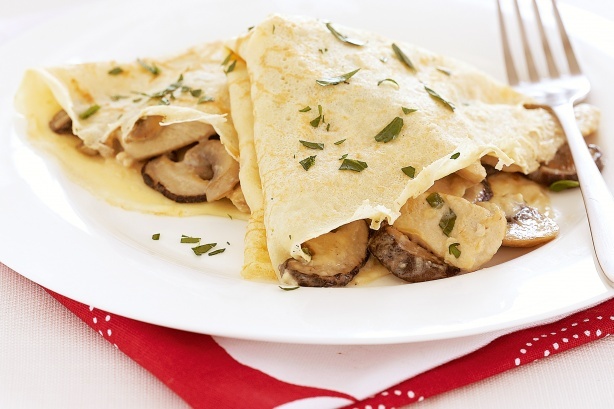 Serve as a side dish with a protein of your choice or as a main dish with bread on the side. 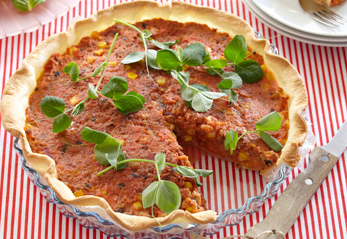 Place the crust in a pie pan and pre-bake it at 200 C for 12 minutes. Peel the carrots and beets, cut them into small pieces, and boil until tender in lightly salted water. Strain the water from the carrots and beets, then mash them. Blend the mash with pressed garlic, cheese, kippers, egg, maize, salt, and pepper. Pour the mixture into the crust. Bake at 180 C for 30 minutes and serve with pea sprouts and a green salad. Melt the butter and let cool. 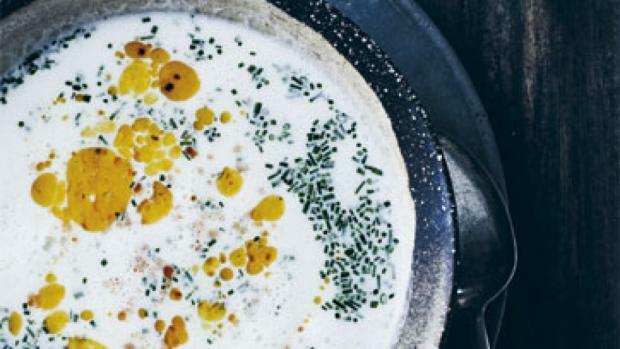 Pour the buttermilk into a bowl and dissolve the yeast in it. Add salt, sugar, egg, and melted butter. Mix in spelt flour and then the regular flour. Knead into a smooth dough and let rise, covered, in a warm place for one hour. Punch the dough down on a floured surface. Divide into 16 equal pieces, form them into small buns, and place on parchment lined baking sheets. Cover and let rise 30 minutes. Heat oven to 200 C. Brush the buns with beaten egg and sprinkle with sesame seeds. Bake for 10 minutes, then cool on a wire rack. Drain the shellfish. 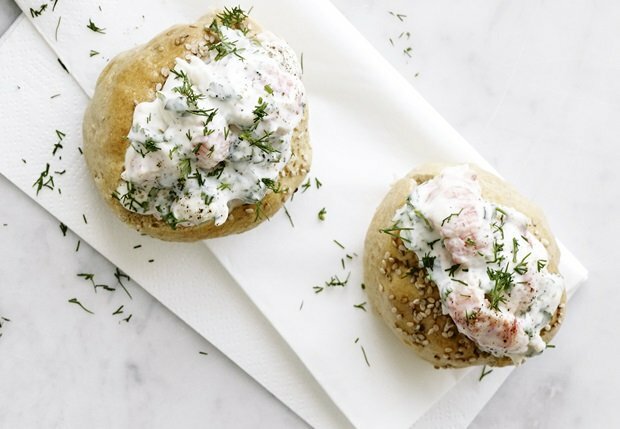 Mix mayonnaise and creme fraiche together, chop up the herbs and add them to the mixture. Season to taste with salt and pepper and fold the shellfish in. Split the buns at the top and fill with salad. 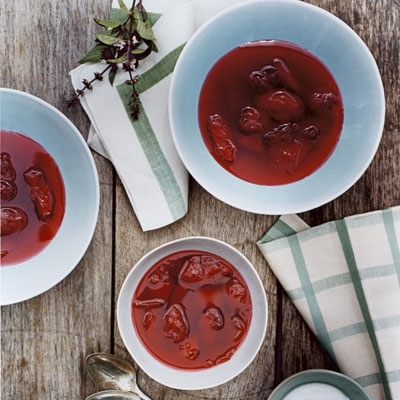 Cook plums and water together until the plums are cooked out. Make a slurry of the flour and a bit of water and pour it into the boiling soup. Stir in sugar. Tip: You can definitely purée this to make a smooth soup. Season the beef with salt and pepper. Heat up a grill pan and grill ca. 3 minutes on each side. Remove from pan. Wash the lettuce and spin dry. Chop the shallot in a very fine mince, and divide the cauliflower into small florets. Wash and trim the strawberries, then chop into small pieces. 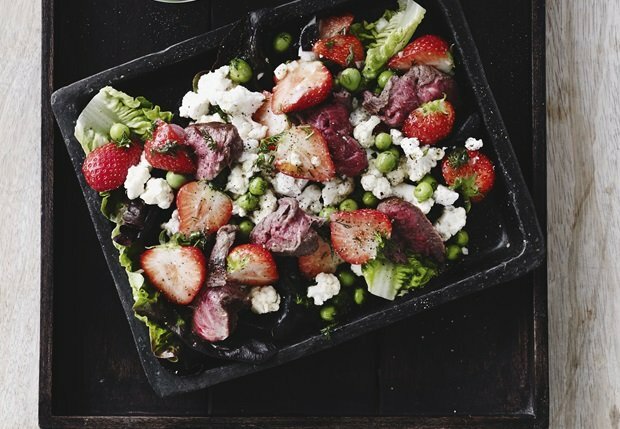 Toss the lettuce with shallot, cauliflower, strawberries, and beef. Crumble up the goat cheese and sprinkle atop the salad. Whisk vinegar, oil, mustard, and honey together. Add chopped dill and the peas. 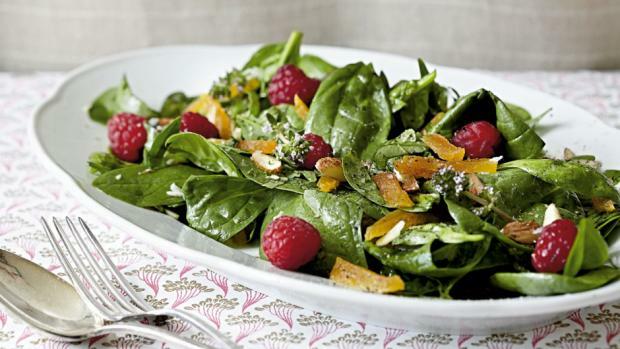 Drizzle the dressing on the salad and serve with slices of sourdough bread. Rinse and trim the greens well. Gently combine the raspberries with the greens in a bowl. Toast the almonds in a bit of oil in a warm pan, remove from heat, and season with salt. Cut the apricots into long slices, cut the basil into long strips, and carefully fold all of that into the salad. Mix the dressing ingredients together and toss with the salad before serving. Separate the letuce out into leaves, wash them, and spin dry. Toast the bread in a pan with butter. Spread mayonnaise on the bread, place 2 large lettuce leaves on each piece. Wash the asparagus and trim off the bottoms (discard them), and steam them until tender in a bit of white wine and butter. 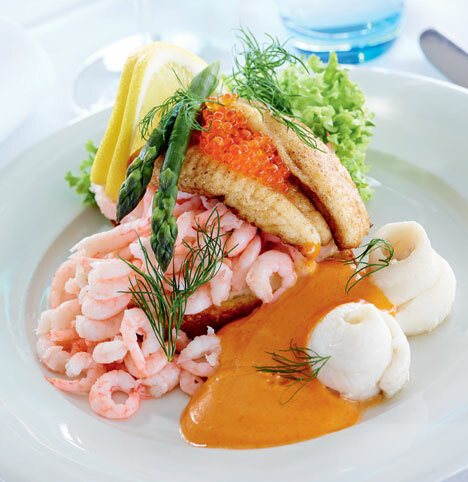 Place 2 fried lemon sole filets rearmost on each piece of bread along with 1 asparagus. Divide the shrimp between the frontmost parts of the slices of bread, and place steamed rolls of lemon sole beside the shrimp along with dressing. Wash the dill, spin it dry, and pluck some out. Cut the lemon into wedges. Garnish the shooting star with dill and lemon, and perhaps some lumpsucker roe as shown in the photo. Soigner the fish, and coat 8 filets in rye flour. Roll the other 8 into small rolls and close them up with toothpicks. Fry the breaded fish in oil, first on one side, add half the butter, let it bubble up, and turn the fish over. Fry until done on low heat. Steam the rolls in a bit of white wine and the rest of the butter. Whisk creme fraiche and mayonnaise together, then whisk in the rest of the ingredients to taste.